Hello my dears! How is your week going? I'm counting down the days until my new assistant starts at work. I can really use the extra help! It's time like these that makes me slow down and remember the simple things in life. Like how to poach an egg properly. I never took the time to figure it out until recently and boy, was it worth it! I can eat one of those for every meal. If you don't know how, I recommend googling it asap! For your eyes today I have another Jackalope by Hare Polish called For Margaret Tenenbaum. I saw The Tenenbaums years and years ago but the humor was too dry for me at the time. I wonder if I'd enjoy it more now. If it's as fantastic as the polish I'm about to show you now, I should be kicking myself for not seeing it sooner. 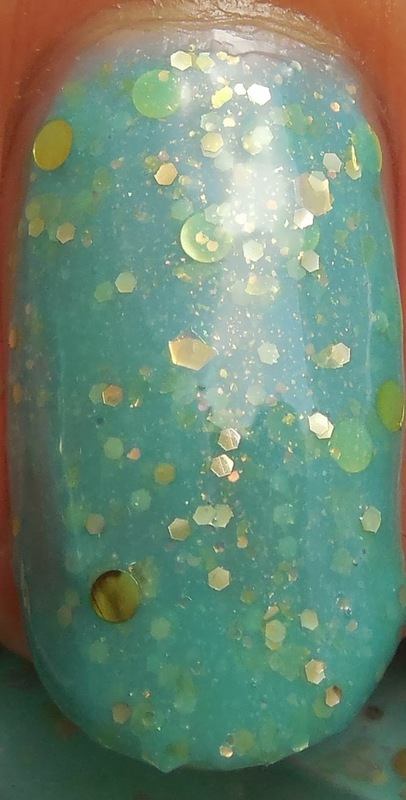 For Margaret Tenenbaum is an sea glass green crelly with gold circles and microglitter. A simple combination but oh so delicious to feast thy eyes upon! Two medium coats are recommended, but here I used three thin coats. I didn't have any trouble except for some slight stacking of glitter on my ring finger and the subsequent bald spot from the brush skipping after said stack. Bah. I finished with a layer of GlitterDaze Super Smooth topcoat. I love staring at that gorgeous shade of soft green. It's a very calming and peaceful shade, and the gold compliments it incredibly well. If I could find kitchen tile in this shade I would be ecstatic. Has a polish ever inspired you to redecorate? Now go google how to poach an egg already! This is a lovely color and incredibly pretty! I just love the combination of gold and sea green. I love the name of it too. I saw the movie many years ago and I think I liked it but it's been too long for me to remember. Though I definitely know that I like poached eggs! I'll have to look up how to make them. I really love simple polishes like these, especially when two colors come together for the perfect combo! Oh! And let me know how it works out when you try making your first egg! thank you!! You can't go wrong with a Hare.